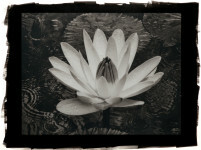 Cy brings his background of artist and art director to the art of photography. His love of photography began in Florence, Italy as a Fulbright student. His learning continued as he collaborated with many of America’s best photographers in his career as an agency Art Director. Cy believes in close, intimate images that show ordinary things in a surprising new light. He paints backgrounds that “float” the subject in a world of its own. 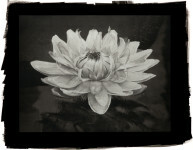 Alternative processes give his images a look that is different and appropriate to the moment. 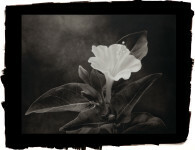 Cy DeCosse’s photographs from The Midnight Garden series are offered as platinum/palladium prints and are printed in limited editions of 30, one size only, 16×21″. 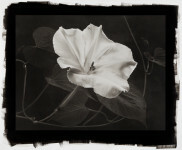 Cy DeCosse’s floral photographs have often been described as magical—and never more so than these in his exhibition Midnight Garden. These are flowers few people ever see—blooms that open at dusk and, like enchanted beings in fairy tales, disappear before the morning’s sunrise. 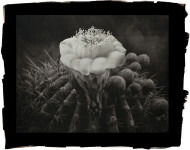 Cy captures the evanescent beauty of 18 of these little-known flowers. The printed images are made in platinum, a medium that perfectly captures the luminous quality of moonlit beauty emerging from darkness. Cy’s interest in night-blooming plants came to him when he heard about one of them, a vine from the jungles of Central America that was growing at a local conservatory. Because the plant bloomed infrequently and only at night, even the conservatory staff had rarely seen the flower, although the blossom was said to be so spectacular it was called ‘Queen of the Night’. Intrigued, Cy persuaded the caretakers to let him know when a bud was forming. One summer evening, he got the call and set up his large-format camera. There was no guarantee that the bud would open that night; however, as dusk fell, the tightly wrapped petals began to loosen and then, in the growing darkness, to very slowly and gradually unfurl. A pungent peppery fragrance filled the air, becoming stronger as the flower opened. At last the delicate white petals stretched to their full extent, 8 inches in diameter, proving the aptness of the flower’s royal name. Cy had photographed many flowers over the years, but this experience was so unlike any other that he wondered about the possibility of capturing images of other night-bloomers. Research showed that a number of cactuses and other plants, pollinated by moths, bats and insects active at night, had flowers that opened after daylight faded. Cy decided to find and photograph as many of these ephemeral beauties as possible.